They're taking adventure to new heights. 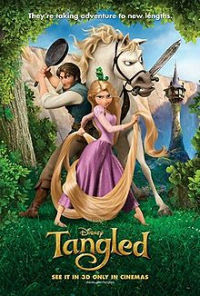 Tangled (2010) is a fantasy comedy animated movie by Disney. Synopsis: Baby Rapunzel (voiced by Mandy Moore) is kidnapped from the royal palace by Mother Gothel (voiced by Donna Murphy) because she finds out that Rapunzel's long golden hair can keep her young. She locks Rapunzel in a tower for 18 years. One day, a robber named Flynn Ryder (voiced by Zachery Levi) enters the tower by mistake. From then on, a series of fantastic and humorous adventures take place. This is a really heartwarming show, perfect to be watched on a weekend. The characters are cute, especially the animal characters - Pascal the chameleon, Rapunzel's pet, and Maximus the royal palace's horse. You'll definitely burst into laughter every now and then with their funny idiosyncrasies. The human characters' voices are fantastic - Rapunzel, Mother Gothel, Flynn Ryder - they are rich, colorful, emotional, and humorous. The scripts are really good, the soundtrack is awesome, and the animation is rich and lovely. What more should I say? Highly recommended. This is definitely another one of Disney's must-watch productions.